Virtual Reality has been a dream for science fiction writers for decades, and it takes places as reality as they dreamt of the highest popularity. Virtual Reality (VR) gaming has been increasing day to day with the development of VR cafes and many people are showing much interest in VR gaming and making it popular. But VR is not just limited to video games only, some other industries have shared its applications and now they are getting a certain bigger market for the VR right now. Here are some industries that will reap the benefits of Virtual reality that aren’t gaming. The practice of virtual reality-based app is not only restricted to well-established app development companies but also lot many start-ups companies practice VR, presenting their concepts and ideas. When someone mentions “Virtual Reality” gaming is the first thing that comes to mind for most of the people, but you should know that healthcare has more applications with VR than Video Games. It is the best technology to learn about the human body and how it will be cured. Most of the hospitals are using this VR technology for starters to train in various activities of the medical field. VR technologies are very helping on surgery for training but actually helping them carry out their jobs too. In addition to making healthcare more practical and comprehensive, medical and research institutions are using Virtual Reality. 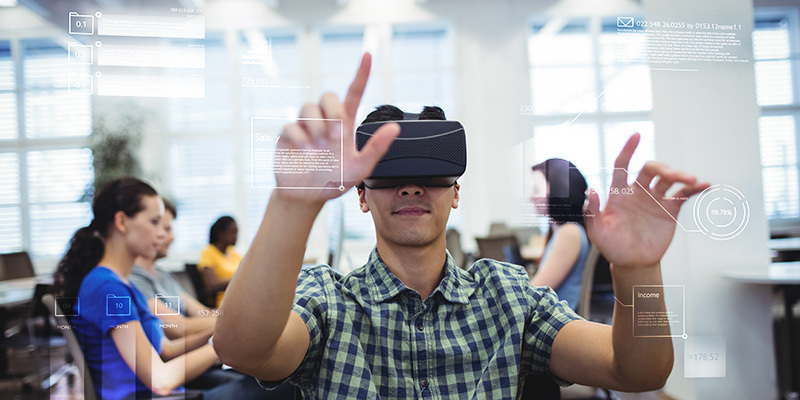 The best part of the VR technology in the education industry is that they can perceive the learning process with more engaging in a 3-Dimensional way. So, it’s easy to understand and grasp the knowledge even in the tough topics and subjects like maths and science etc. usually, many students were felt bad about mathematics and physics, sometimes history but VR technology will be the easy solution for that problems. With virtual reality, education is moving on from pens and books to interactive technologies that help to impart knowledge and understanding. Experience is always the greatest teacher. With VR technology, Already NASA is preparing astronaut journey to the Mars, its one the best use of the VR technology. Most of us probably won’t experience the realities of space exploration at all, let alone in the next few decades, as scientists work to get the first man on Mars and improve technologies for longer journeys. So, we are going to experience that in future by the VR Technology. Beyond virtual exploration, virtual reality additionally offers space organizations a realistic device for training astronauts, designing sustainable human missions and provoking the next generation of space scientists. In the traditional way, the marketing of traveling is happened by the ads on a search engine and storytelling like that but these days after the VR technology, it has been replaced with the travelers can be experienced directly from their home and can plan more about the trip and all. They can watch every place, every hotel in 360 degrees and 3Dimentional view and videos. Assume, if you experience all the exotic places to decide where to go from your home itself? That’s cool right. It’s already a big asset to this industry. VR technology for business applications is increasing slowly and steadily. Although the field is new, VR technology will definitely introduce the modern way of business tactics. Training employees with VR technology will be the first step towards the successive business way. Mixed reality data organizations, VR communication and collaboration, employee recruitment and retail sector are the various application in business. With the help of VR, you can attend the board meeting from wherever you want, there is no chance of attending physically required. VR is not only doing well at above industries but in all. The only thing that limits this VR technology is our imagination so, don’t be surprised if VR technologies find its way to other industries also. So, as we can’t predict the future technology, let’s see what other applications VR Technology will bring. Modern smartphones are being built with the support of VR, and they are doing quite good. Mobile app development companies also working to promote VR technology in various industries as well. FuGenX Technologies is one of the best virtual reality game development companies in Dubai. We can provide you with excellent VR visualizations for your customer.